The International Monetary Fund (IMF) has urged the government to implement a raft of measures to raise revenue and reduce spending to rein in a ballooning fiscal deficit. In a statement on Monday following a visit by an IMF mission for the 2012 Article IV Consultation – the organisation’s “regular exchange of views with member countries” – the IMF team noted that strengthening government finances was “the most pressing macroeconomic priority for Maldives”. “The fiscal deficit is expected to rise in 2012 to 16 percent of GDP [Gross Domestic Product] in cash terms, and likely even higher if one accounts for the government’s unpaid bills, accumulated in an increasingly challenging environment for financing,” the IMF mission stated. In April 2012, the head of a previous IMF mission to the Maldives told Minivan News that the country’s fiscal deficit was “substantially understated” at less than 10 percent of GDP as projected in the 2012 budget, predicting a figure closer to 17.5 percent of GDP or higher. “The large deficit has implied a rise in the public debt ratio, which now stands at over 80 percent of GDP, and has also helped to boost national imports, thus worsening dollar shortages in the economy and putting pressure on MMA [Maldives Monetary Authority] reserves,” the more recent IMF mission said in its statement. “Gross international reserves at the MMA have been declining slowly, [and] now account for just one and a half months of imports, and could be more substantially pressured if major borrowings maturing in the next few months are not rolled over,” the IMF mission warned. Recommendations to formulate “a realistic and prudent budget for 2013” meanwhile included hiking T-GST (Tourism Goods and Services Tax) and “selectively” reversing import duty reductions. “Higher Treasury bill yields, in conjunction with some technical changes to the monetary operations framework, may also help to ease the government’s financing difficulties,” the mission noted. Following consultations with President Dr Mohamed Waheed Hassan Manik, Finance Minister Abdulla Jihad, members of parliament and MMA Governor Dr Fazeel Najeeb, the mission noted that “the authorities have expressed an interest in a Staff Monitored Programme,” for which further discussions would be held. In its meeting with parliament’s Finance and Economic Committees last week, the IMF mission urged the Majlis to expedite legislation on fiscal responsibility. The mission said it would prepare a report for consideration by the IMF Executive Board in January 2013. Following the visit of the IMF team from October 30 to November 12, head of the mission Koshy Mathai met the press at the MMA auditorium on Monday. Hiking T-GST and raising import duties on oil and liquor were among drastic austerity measures proposed by the Finance Ministry to parliament’s Finance Committee in August. Several resort managers told Minivan News at the time that the proposed measures will affect the financial viability of the tourism industry. Jihad told local media yesterday that the ministry accepted the recommendations and would work with parliament to implement the measures in next year’s budget. Mathai meanwhile observed that government subsidies on foodstuff imported by the State Trading Organisation (STO) benefited rich and poor alike. “The resorts are buying these staple foods at highly subsidised prices,” he noted. Mathai also stressed the importance of instituting a Pay Commission to streamline the pay structure for government employees. “We have a lot of independent institutions in this country and they are all on different pay scales,” he observed. “To us that seems like a very logical thing, a very logical way of reducing costs, but of course it has to be done in a voluntary way,” Mathai said. Economic diversification was also necessary to ensure that the economy has “more than one or two bases to go forward and reduce vulnerabilities to risks,” he added. “Between 2004 and 2009, the average monthly salary of a government sector worker increased from MVR 3,223 (US$250) to MVR 11, 136 (US$866),” explained a UNDP paper on achieving debt sustainability in the Maldives published in December 2010. “This strategy led to a large increase in the number of civil servants from around 26,000 in 2004 to around 34,000 by 2008 or 11 percent of the total population. Thus the government simultaneously increased the number of public sector workers as well as their salaries,” the paper noted. Consequently, recurrent expenditure – wage bill and administrative costs – exceeded 82 percent of total government spending in 2010. However, the new government’s efforts to enforce pay cuts of up to 20 percent and downsize the civil service – which employs a third of the country’s workforce – were met with “a severe political backlash from parliament,” the UNDP paper observed. Introducing an economic reform package in late 2011, former President Mohamed Nasheed’s administration insisted that increased revenue from new taxes would match expenditure, and boasted that the 2012 budget was the first in many years to balance income and expenditure. “Loosening the policy means pushing the economy to grow faster, creating more import demand, creating more demand for dollars – you don’t want to flood the system with rufiyaa so that people can bid many rufiyaa for each dollar in the parallel market,” he explained. Resorts should be “restricted to small value transactions that are appropriate for the visitors that are staying there,” he said. Mathai also explained that the requested “Staff Monitoring Programme” would not involve disbursement of funds from the IMF. “We would basically see how the government is doing against its own targets – it would set targets for itself for performance of these different economic areas – and then if the track record is built up and things are going well, then maybe later we could discuss having a programme where money is disbursed,” Mathai said. It is not possible to see this government, run by traitors, can do this. PPM will never allow it to happen. It will press Waheed to spend more on Security Forces. DRP has noting to say. JP can howl to its fill, but can be of no use because the drill has no head. Rest of the so called parties are simply useless and can be of no value to this crisis. MDP is the only hope, that can bring a difference. But as of now, they are helpless! IMFs story of excessive debt is now like a mantra. 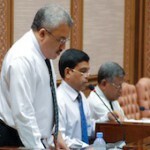 There is nothing there that an avarage Maldivian does not know. I fail to see why this is news. The IMF is a voice we have to listen to, but every successful country I have seen develop well has listened carefully to the concerns of world parties and financial counter-parties, but found it's own unique path to success. Most fundamental is understanding the overall economics of the country and where it can grow revenues, not just tax more of current revenues and where good investments will bring good returns through increases in productivity, efficiency, and market access. So far, in the last year or two all the reports I have heard about from outside parties like the IMF have focused on government reform and tax implementation. While it may be true that some other island nations have higher taxes, are they considered successful growing economies? This is not clear one way or the other. What the IMF report as discussed in this article does not discuss is the potential growth of trade and tourism to the Maldives and making a bigger pie. There is substantial room for new domestic and foreign investment into the Maldives in fisheries, aquatic farming, transportation, and tourism. A vision of Maldives as a destination not just for the current nearly 1 million tourists, but for 2 million or even 5 million is a bold vision of growth. Investors don't yet see Maldives as that kind of investment. They are still going to Thailand, Indonesia, Fiji, and other places to invest in tourism development. While cost cutting and government rationalization is very important, so are policies that spur and support growth. Taxation is important, but taxation implemented too quickly can kill growth through unintended consequences. For example, in certain industries it is customary to have tax treaties between countries covering certain sensitive industries (for example businesses that depend on lease of heavy equipment from foreign sources, like ships and airplanes) - but if taxes are implemented before the treaties are, then those industries can suffer tremendous damage that was never intended by the tax authors. Maldives needs taxes and government reform to match it's needs as a fast developing nation. But it also needs a pro-growth strategy and vision. Ten or 15 years ago, Male' had few buildings over 4 or 5 stories. Now the average height of buildings is nearly double this and a whole new island suburb has been built. Where will we be in another 10 years? What policies will take us there? IMF and government can't be fixated on using taxation and import duties as means to increase government revenue. Economic growth through increased production of economic activities is needed to generate fresh revenue. There is hardly any incentives or assistance given for private sector growth in this country. Starting from dollar shortage issues to crime, there are only hindrances that the private sector is faced with. There is only so much that the tourism industry can do, diversification is needed and the policy makers need to be committed to bringing about change instead of just talking about it. The economic situation of this country is not just a topic to be debated about in parliament and used as a political tool, and forgotten about the moment the actors are off the screen. We are in real trouble here, and instead of delaying reform even because of elections, the government should have the guts to cut unnecessary expenditures once and for all and steer the country towards a sustainable path of economic development. Think this one through very carefully. Maybe it wouldn't have an effect if the Maldives were a safe, well managed and happy destination where tourists are made to feel welcome. But viewing the situation as rising Muslim extremism, laws against alcohol/pork and increased murder rates, makes a potential increase in taxes the "straw that breaks the camels back". It's sad to watch an entire nation slowly committing suicide. is there anyone in maldives with any economic experience? ?